Business success has allowed David Bradley ’75 to pursue some old dreams—like owning The Atlantic magazine. One morning in November 1993, David Bradley boarded an airplane at Dulles Airport, bound for Vietnam. He was accompanied by his Swarthmore classmate and close friend Jim Snipes ’75, who had purchased first-class tickets on the occasion of Bradley’s 40th birthday. It was to be one last “boys trip,” Bradley says, and as they prepared for takeoff, Snipes advised his friend to stay awake for the first 13-hour leg to help him adjust to the time difference. Within 20 minutes, however, Snipes himself had nodded off, leaving Bradley alone with his thoughts. Today, Bradley identifies those hours of reflection aloft as a pivotal moment in his life. “I had that terrible experience of being 40 years old, alone, utterly yourself at 30,000 feet, no work to do, and you begin thinking, ‘What am I doing?’” he says. “It was an existential poison that set in” as he critically reviewed his own life. By almost any measure, Bradley’s first 40 years had been successful. After graduating from Swarthmore, he had gone on to Harvard Business School and Georgetown Law School. He had started his own consulting companies and built them into multimillion dollar businesses. He was happily married and had two sons. But something was missing. Since he was 13, Bradley had wanted to be a politician. “I always wanted to be the young Republican senator from the state of Maryland,” he says. But at 40 he no longer felt young. Moreover, he no longer was a Republican; he was a registered Independent. And he lived in the District of Columbia—not Maryland. “But the big problem—and this was the hard part—was I realized that I didn’t have a leadership gift,” he says. So Bradley decided to shift tacks. His companies—the Advisory Board Company and the Corporate Executive Board—were never ends in themselves. He had intended to sell them off and then, financially independent, begin his political ascent. Instead, he divested himself and used his new fortune—in excess of $300 million—to become a media mogul. First, in 1997, he bought the National Journal Group, a collection of Beltway magazines and Internet digests. And then, two years later, he purchased his flagship, The Atlantic, the august political, cultural, and literary journal founded 150 years ago by Ralph Waldo Emerson, Henry Wordsworth Longfellow, Oliver Wendell Holmes, and James Russell Lowell. “We were probably the straightest kids in class,” says Elizabeth Scheuer ’75, who attended Washington’s Sidwell Friends School with Bradley. The Vietnam War was raging, and the table conversation often turned to politics, with Elizabeth’s father, also a Swarthmore graduate, arguing for a pullout. Bradley, already a staunch Republican, defended Nixon. “David held his ground,” Scheuer says. Swarthmore was not Bradley’s first choice for college. First, he enrolled at Principia College, a Christian Scientist school in Illinois. At the same time, he was volunteering for Nixon “on a campaign we don’t put on our resumes anymore—The Committee to Re-Elect the President.” During his spring semester, Bradley pulled the first slot in the 1972 military draft lottery. “I couldn’t possibly pull off conscientious objector status,” Bradley says. “I’d been way too pro-Vietnam War to pull that off.” Instead, he returned to Washington, continued to work on the Nixon campaign, and began his sophomore year at George Washington University, where he enrolled in ROTC classes. But Snipes’ early impression quickly was dispelled, “which is a tribute to David,” he says. Sure he was conservative, but Bradley also had a wicked sense of humor, which leavened his political passions. In the dorm rooms, people would seek out Bradley for advice. “David always seemed to have a plan for his life,” Scheuer says. “He was very focused.” Perhaps his lasting student influence on the campus was his role in the successful campaign to move exams before Christmas so that students could enjoy the winter break away from their books. “For years, there had been attempts to get this moved, but David really was an organizational mastermind and led a coordinated campaign that brought about a faculty vote to make the change,” Snipes says. Bradley applied to business school—at a time when law school was the popular choice—thinking it would further his knowledge of economics. (It proved a disappointment in that regard, he said: “Turns out business school is really a trade school.”) But beyond intellectual considerations, Bradley knew he wanted to be an entrepreneur, to establish an independent financial base for a future political run. He had learned a valuable lesson working for the Nixon White House. “I knew the Haldeman family, I knew the Erlichman family, I knew people who went to jail,” he says. “And one of the things you saw … was the Nixon people themselves were divided into two camps.” One camp consisted of the hangers-on, the people whose rise to power was based solely on their ties to Nixon. Then there were people like Secretary of Defense Mel Laird and Vice President Nelson Rockefeller, who earned a spot in the administration based on their own political bona fides. Bradley caught a break thanks to David Stoner, an avuncular senior partner at Towers, Perrin, Forster & Crosby. He made his pitch, and Stoner, like many before him, said he didn’t need that sort of research. “I’d seen a rejection before, so I figured I’d pack up and leave.” But then Stoner asked, “Is that all, David?” Flummoxed, Bradley said he’d finished his presentation. So, Stoner repeated his question, and it dawned on Bradley that maybe he had taken the wrong approach. “Well, tell me Mr. Stoner, what do you need?” he asked. The start-up took more of Bradley’s attention than law school. Selected to the law review, he couldn’t put in the necessary hours but finagled an arrangement whereby he stayed on the masthead in exchange for defrosting the office’s freezer each Friday night. Nonetheless, he graduated in good standing and passed the bar. But he never practiced law, instead devoting himself full-time to the company. Hospitals, banks, and human resource departments signed up, and Bradley’s company would send them analyses. Membership might cost an annual fee of $30,000, but that was nothing compared to the millions of dollars it could cost to hire a consulting company to come in and overhaul the business. 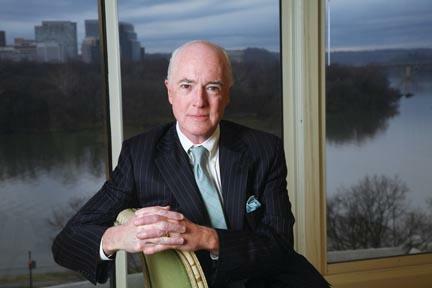 In 1983, Bradley founded the Corporate Executive Board, another best-practices research firm. But for Bradley the year was more noteworthy for the introduction of Katherine Brittain into his life. At the end of her freshman year at Princeton, she happened upon a job advertisement for a summer internship at the Advisory Board. “What attracted me to the work was that they advertised ‘research on the European art market’ and at the time I was thinking of an art history major,” she explained in an e-mail. And while the advertisement proved to be misleading—“the announcement was the last I ever saw of ‘European art market research!’”—Brittain caught Bradley’s attention. Bradley was persistent in his courtship, and in 1986 they were married. Bradley made one brief foray into politics, when in 1989 he appeared at a forum for prospective Republican candidates for Maryland’s First District congressional seat. Contemplating a run, Bradley prepared a heavily researched presentation with accompanying handouts. The crowd heard him out, but asked no questions. It was not the enthusiastic reception Bradley had hoped for. “I don’t take over a room,” Bradley says. “When I have an argument, it doesn’t carry the day.” But that realization didn’t fully sink in until four years later, when hours of reflection on board that transcontinental flight led Bradley to the conclusion that he needed to find another way to make a political impact. Many media moguls have little, if any, firsthand journalism experience. Bradley didn’t have much. But he had always been drawn to magazines and had a high regard for political and long-form narrative journalism—in other words, the types of journalism that typically aren’t profitable. In the mid-1990s, not long after his trip to Vietnam with Snipes, he began to survey the media landscape. A magazine like the New Republic might have been a perfect fit, but its then-owner, Martin Peretz, wasn’t interested in selling. Then, in May 1997, the National Journal became available. The magazine, a sort of Congressional Quarterly of the executive branch, was owned by the Times Mirror Company, a huge media conglomerate whose holdings include the Los Angeles Times and the Baltimore Sun. The National Journal was a tiny part of this empire, but the magazine was losing money. Corporate executives gave the magazine’s longtime publisher, John Fox Sullivan, advance notice of their intention to sell, and he asked for a week to sound out offers on his own. Through a mutual friend, a meeting was arranged with Bradley. Over the course of a three-hour dinner, Sullivan was persuaded that Bradley was a good fit. For $11 million, the magazine was his. “It was lucky and fortuitous that David came along, and not a single moment in the 10 years that have passed have I regretted it,” Sullivan says. Times Mirror had been a benign corporate owner, but the National Journal, Sullivan says, was “lost in this big media empire, and they didn’t push us to be as ambitious as we could have been.” Bradley provided that push. While he was interested in making the magazine profitable, “his priority was quality, and bringing in and keeping good people,” Sullivan says. He brought the same priorities to The Atlantic, a magazine in much deeper financial trouble, which he bought from Morton Zuckerman in 1999 for about $10 million. Many media moguls are unabashed in advancing their political views in the pages they own. Rupert Murdoch, for instance, has been accused of pulling punches on his papers’ China coverage to protect his business interests. At the New Republic, Peretz has long fawned over his twin obsessions: Israel and Al Gore. As a self-described failed politician, it would be understandable if Bradley were to use his publications as a pulpit. But that’s not the path he has taken. Perhaps this has something to do with his own political evolution from a die-hard Republican to registered Independent. (“And,” he says, “I’m having a hard time keeping [my wife] from becoming a Democratic Party activist.”) But those who know him well say Bradley is not guided by ideology. “David’s not interested in pushing a certain position,” Sullivan says. “He’s more interested in the process, and whether you come to a position honestly and analytically.” When he acquired the National Journal, Bradley was less interested in maintaining the magazine’s strict nonpartisan tone than bringing in provocative and articulate writers of any political stripe. At The Atlantic, Bradley’s influence can be seen in a shift away from the wonky and occasionally dry policy essays that came to increasingly dominate the magazine’s pages toward a renewed emphasis on narrative and investigative journalism. He’s opened up his wallet to attract star writers such as James Fallows, an Atlantic veteran who had left the magazine, and Mark Bowden, author of Black Hawk Down.